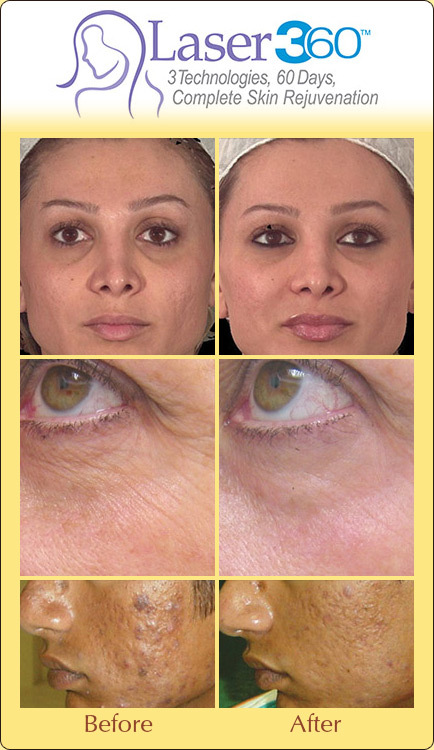 Reverse your fine lines and wrinkles and attain total skin revitalization sans injections utilizing Laser 360. The procedure uses 3 innovative technologies through a series of office visits in just 60 days in order to achieve full results. The three different technologies are combined into a treatment plan that is tailored to your needs. It is the ideal procedure for those that are not ready to commit to a full facelift but are no longer content with the results of topical creams and lotions. 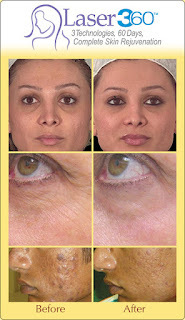 The procedure will enhance your skins color, texture and tone. AFT intense pulsed light is utilized in order to even out your skin color, reduce tiny broken blood vessels, and get rid of superficial pigmented and vascular marks. Near-infrared lasers are used to firm up any loose skin throughout your eyes, nose and jaw in order to regain a more youthful, contoured appearance. Pixel lasers aid in stimulating new collagen to grow in order to enhance skin’s texture and tone to eliminate fine lines and wrinkles. This works by producing thousands of microscopic perforations but the skin remains undamaged around each perforation. This permits the top layer of skin to heal from the edge of these miniscule holes rather quickly. Each of the lasers is used through a hand piece that is placed on your skin. The area being treated will progressively revitalize throughout the duration of your customized treatment plan. Laser 360 is comfortable and does not require any downtime or recovery from the procedure. It can be used on any skin type and you are able to return to normal activities immediately after each session. In order to see if Laser 360 is right for you and to discuss a customized treatment plan, call The Shaw Center for a consultation at (480)767-1900.